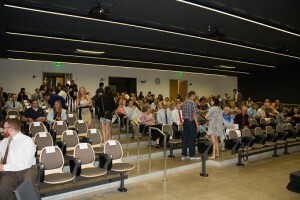 MBA candidates take their seats before the graduation ceremony in Stirek Auditorium. Eighty-eight students representing eight nations were recognized June 13 for having completed their MBA studies during the 2014-15 school year. 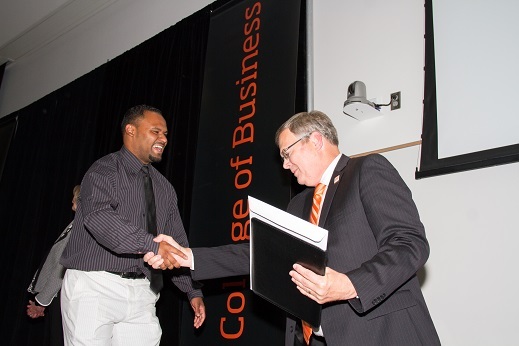 The Oregon State MBA program features eight different tracks, and the graduation ceremony honored students from all eight: research thesis, commercialization, business analytics, marketing, accountancy, wealth management, global operations and executive leadership. Prior to the ceremony, six MBA graduates one other College of Business student were inducted into Beta Gamma Sigma, an international honor society serving schools accredited by the Association to Advance Collegiate Schools of Business. The inductees were Sinae Cho, Casey Miller, Yuriy Mikitchenko, Gary Phibbs, Kevin Russell, Halley Todd, and Phil Walter. Erick Frack, president of Katapult Partners, LLC, and a 1981 College of Business graduate, delivered the keynote address at the MBA graduation ceremony. Frack’s talk centered around leadership, which he believes centers around caring about other people and listening to them. “Your ability to show yourself as a good leader will help you more than anything,” Frack said. The ceremony also recognized Grace Berczel, Casey Miller, Thomas Nguyen, Sara Kelley and Dan McCain for completing their combined doctor of pharmacy/MBA degree. Following the 75-minute program, graduates and their guests repaired to Austin Hall’s third floor for a reception. It was the second celebratory event of the day at Austin Hall, which in the afternoon hosted an outdoor reception for the College of Business’ newest bachelor’s degree recipients and their families and friends. Each of the 753 graduating seniors who stopped by received a COB business card holder as a gift from the college, and the event also included a photo booth and a group picture of all of the graduates on hand. Associate dean Jim Coakley, right, congratulates MBA graduate Ryan Perry. Posted in Events, Student Highlights. The College of Business prepares people to measure up against the best, says Curt Willener, this year’s Distinguished Early Career Business Professional. The Hillsboro resident should know. Three years after his OSU graduation, he was accepted into the MBA program at Harvard Business School. “OSU was on my list, but since I’d gone there as an undergraduate, I wanted a new experience,” who at the time was working at a mill in Albany. “I had just gotten done with a super dusty, 14-hour shift when I talked to (Dean) Ilene (Kleinsorge) about going to graduate school. I think I got her office dirty. But she was so open to talking with me and supporting me, and Ilene wrote a recommendation letter that helped me get into Harvard. For Willener, now operations manager and Danaher Business System leader at Tektronix/Danaher, the route to OSU began on Sauvie Island, where from age 12 to 18 he worked at a local farm and kennel. After graduating from Scappoose High School, he followed in the footsteps of his OSU alum father, Henry, and headed to Corvallis. Willener will be honored May 11 in Portland at the college’s annual Celebration of Excellence, along with the rest of the 2015 award winners as well as the retiring Kleinsorge. For more on the event and the honorees, follow the College of Business blog as the countdown to the celebration continues over the next couple of weeks. The evening begins with a reception at 5:30 p.m., followed by dinner and the awards presentation. For more information or to register, contact Elsa Frey at elsa.frey@oregonstate.edu or call 541-737-6648, or register online at http://business.oregonstate.edu/awards. Posted in Alumni Highlights, Events. When Katie Haakenson was still an intern, Boeing tasked her with creating and hosting a conference for the company’s project managers in the Puget Sound area. The idea was for them to talk about methodologies they’d used and lessons they’d learned. 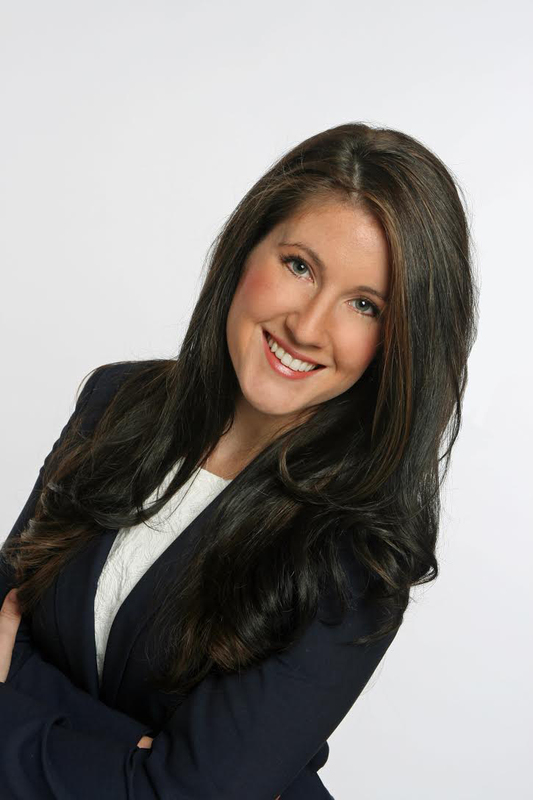 The creativity, leadership skills and organizational savvy that Haakenson used in developing the conference are among the reasons she’s this year’s Distinguished Young Business Professional. Haakenson, hired as a permanent employee after starring in her internship, spent nearly four years with Boeing at the Everett (Wash.) Delivery Center. She’s now a project leadership associate with Point B Management Consultants in Seattle, having started there in January following one-year stints at Microsoft and Logic 20/20, also a Seattle-based consulting firm. The bustle of Seattle represents a stark change from Haakenson’s youth in Corbett, Ore., where her graduating class at Corbett High featured 45 people. 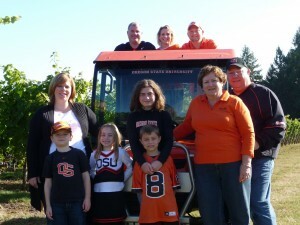 Choosing Oregon State after a campus visit and conversations with faculty made her feel at home, she worked two jobs to pay for school and still graduated in three years, then stayed a fourth year and collected an MBA. “I really liked the IBP (integrated business plan) program, and I wanted some additional time with College of Business faculty since I’d learned so much as an undergraduate,” Haakenson said. Matt Spathas with his wife and four children. The son of an OSU-educated entrepreneur and a graduate of the same Portland high school that produced Linus Pauling, Matt Spathas’ trail to Corvallis was blazed early on. “My dad told me, ‘You can go to any college you want, but the only one I’ll help you pay for is Oregon State,’” he said. Four decades later, there’s little doubt in Spathas’ mind that his father really did know best. “I’m really grateful for the education I received at Oregon State,” said Spathas, this year’s Distinguished Service Award winner. Spathas, College of Business class of 1980, is one of three managing principals at SENTRE Partners, a San Diego-based firm that describes itself as “Stewards and Entrepreneurs of Real Estate.” He’s been with the company for 21 years and in his career has had a hand in more than $2.5 billion in transactions. “It wasn’t exactly what she had in mind,” Spathas joked. As a senior, Spathas was named athlete of the year at Washington High School – where the principal was former OSU football All-American Bill Gray. After two years, Spathas and wife, Kristen, also an Oregon State graduate, moved to San Diego, where Spathas became a marketing principal for Trammell Crow, the nation’s biggest commercial development company. 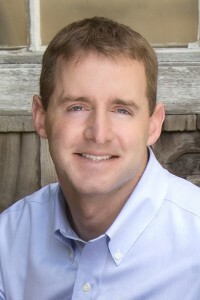 He joined SENTRE Partners in 1994. Spathas will be honored May 11 in Portland at the college’s annual Celebration of Excellence, along with the rest of the 2015 award winners as well as retiring Dean Ilene Kleinsorge. For more on the event and the honorees, follow the College of Business blog as the countdown to the celebration continues over the next couple of weeks. Ryan Hildebrand never set out to define himself as an entrepreneur, and Tim Hildebrandt doesn’t necessarily think of himself that way, either. 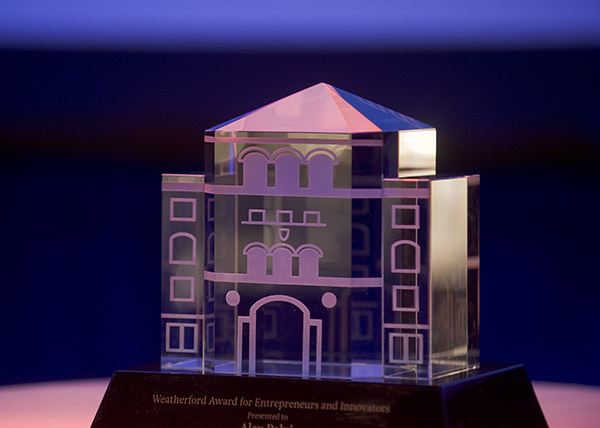 Labels aside, their innovative excellence has earned each of the College of Business graduates a 2015 Weatherford Award. Hildebrand is a cofounder of Seed, an online and mobile banking service for startups headquartered in Portland and San Francisco. Prior to Seed, he was vice president of finance for Simple Finance, a similar type of company whose target clientele is 18- to 30-year-old consumers; while at Portland-based Simple he hired Hildebrandt to be the company’s controller. Hildebrandt and Hildebrand worked together on the $117 million deal that saw the startup acquired by Spanish banking giant BBVA. That mission statement also describes Hildebrandt, who now has Hildebrand’s old job at Simple. “Tim is an excellent accountant, and what he was able to do was take those excellent skills and experiences and bring it into an innovative environment and apply it directly to something that didn’t exist,” College of Business Dean Ilene Kleinsorge said. Hildebrandt and Hildebrand will be honored May 11 in Portland at the college’s annual Celebration of Excellence, along with the rest of the 2015 award winners as well as the retiring Kleinsorge. For more on the event and the honorees, follow the College of Business blog as the countdown to the celebration continues. Posted in AEP, Alumni Highlights. Stephen Bailey with wife Marian and other members of their family. 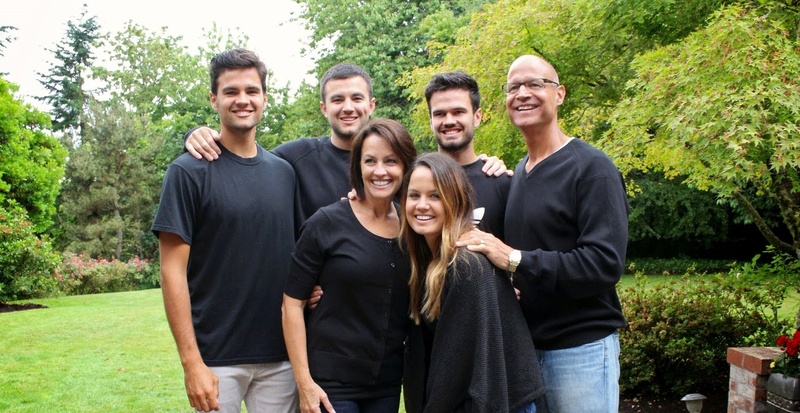 Stephen Bailey had gravitated toward Oregon State partly because he was a Beaver sports fan, and as graduation neared, he came to realize his choice of universities was fantastic for academic and career purposes, too. Bailey had grown up on a Tillamook farm and developed an affinity for Oregon State while following the exploits of all-America end Vern Burke, who in 1962 had the best receiving season the NCAA had yet seen, and quarterback Terry Baker, that year’s Heisman Trophy winner. A football and basketball player for the Tillamook High Cheesemakers, Bailey arrived in Corvallis ready to meet any challenge, prepared by his duties on the family’s 120-cow dairy. After completing his degree, Bailey went to work with Touche Ross & Co. (now known as Deloitte & Touche) as a CPA and audit manager. That was the springboard for a long career, capped by a 10-year stretch at Flir Systems, the thermal-imaging company he helped turn around from the brink of failure, that earned Bailey induction this year into the College of Business Hall of Fame. He’ll be honored May 11 in Portland at the college’s annual Celebration of Excellence, along with the rest of the 2015 award winners as well as retiring Dean Ilene Kleinsorge. For more on the event and the honorees, follow the College of Business blog as the countdown to the celebration continues over the next couple of weeks. 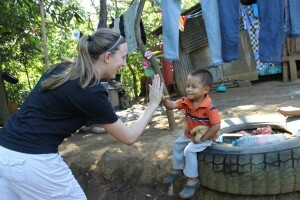 High-fives from Nicaraguan children were among the highlights for the OSU Enactus group. For eight members of OSU Enactus, winter break meant a trip to someplace warm, but not to rest and relax. Enactus is an international group through which university students work to discover their own potential while helping to improve the economic situation of others, and the Beaver chapter of the organization sent a contingent to Nicaragua for continued work on a microloan program there. OSU Enactus has made multiple journeys to Nicaragua, including one last July. “There were many heartwarming stories that gave us contentment for all of the hard work that had been put in,” Garret Flowers reported on the OSU Enactus blog. One of them involved a woman named Andrea Sanhante, who has a business that sells tortillas, beans and cheese to community members.